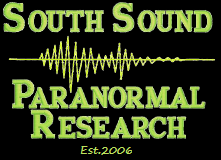 South Sound Paranormal Research is available to help those who believe they are experiencing paranormal activity. If you would like documentation and direction about your next step, email us. South Sound Paranormal Research is celebrating 10 years of providing our services to the community. Since 2006, South Sound Paranormal Research (SSPR) has investigated claims of the paranormal in homes and businesses in Washington and Oregon. SSPR was formed to help not only ourselves to better understand the paranormal world, but to help those who were experiencing activity within their homes or businesses. As Paranormal Investigators, our team is committed to helping individuals, families, and businesses who feel they are experiencing paranormal activity. There have been many changes to our paranormal team over the past 10 years, and yet our core value remains, that of providing the best services we can to our clients and fellow paranormal colleagues. We do this by documenting and recording the origins of unexplained events, whether real world or paranormal. We are dedicated to providing confidential and truthful evidence collection and reporting. If you believe you're experiencing ghosts or a haunting and want help from experienced investigators, email or call us. As long as there is a need to seek the answers for the unknown, South Sound Paranormal Research will continue to investigate and help our community. All investigation services are free.